The Deep Sea Diving Bell is a mini-sub, one usually used in certain long-duration lower-depth industrial labor. It has Ø1 armature, Ø2 lights, and Ø2 maneuvering jets. The starboard armature is far too short to actually be used, there is no portside armature, the jets constantly fall off, the lights wouldn’t stay on and were lost in short order, and last but not least the piece that holds the canopy in place constantly comes off. I would definitely have gotten one of these for myself (had I not already gotten one for my son), but I’d feel forced to glue the jets in place and replace the starboard armature with a more useful one and add another portside. My son loves it as is. Is the diving bell water tight? Does the klicky remain dry and able to breathe air inside? Thank you for the review! Do you feel this set is a good investment with all of the short comings? I have a couple of these and never had a problem with anything falling off or being loose. I guess it depends on how rough you are with it. The upper half is watertight as it forms a bubble, and from what I recall from long immersion (several hours) during my dive tests it's pretty watertight as a whole. I agree the arm is too short for any real use. It can be extended or modified easily, if you have the parts. 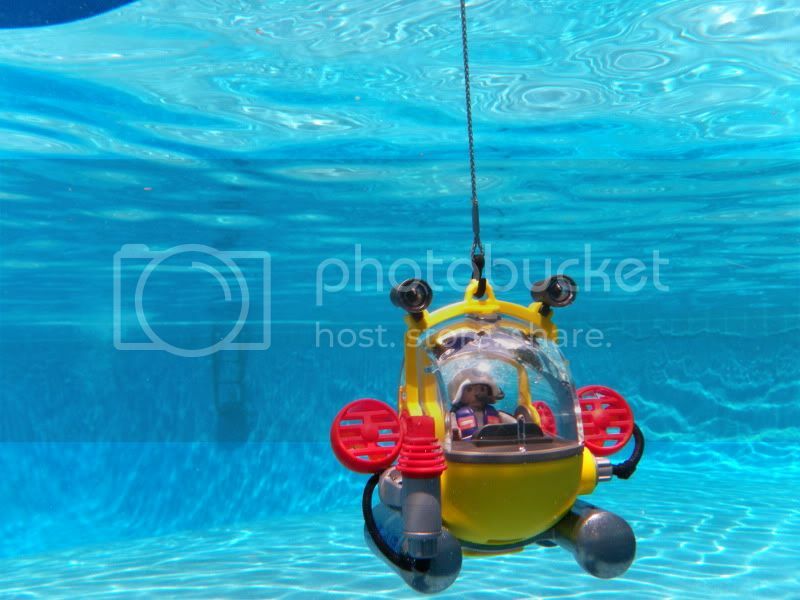 I plug a spotlight in the "hand" and treat this as a primary scouting unit, using the 2-man submersible for more serious manipulative work, and the diver for working in tight spots. The upper half of the bell usually is. After use, you need to open up the canopy and let it dry out or it may never do so. I’d make the modifications, but my son would NEVER forgive me. Yes, if you’re interested in nautical themes, especially modern ones (I’m certain it could be converted to a sail era diving bell, I just hadn’t thought of doing so until literally as I am typing this). If you don’t like or don’t care about nautical themes, there’s no point to buying them- But then you probably wouldn’t be reading this anyways. for a while - while reading just the title of your thread - i thought playmobil had released a 1800's diving bell. i confess i am a little bit sad now but your review is still great, thanks. The only issues I've had with mine are the little rubber hoses constantly pulling out of their fittings. Mine is reasonably water-tight. There's a little seepage into the cabin, but nothing enough to drown the little aquanaut inside. Curiously, it seems to let just a little water in no matter if it's simply in the tub or testing crush depth at the 8-foot end of the pool. Yes, they do pull out easily but they go back in just as easily.